[Michael Oren's] "Six Days of War"
The most overwhelming victory in the annals of warfare took place in June 35 years ago, when Israeli forces defeated the Egyptian, Jordanian and Syrian armies in a mere six days. 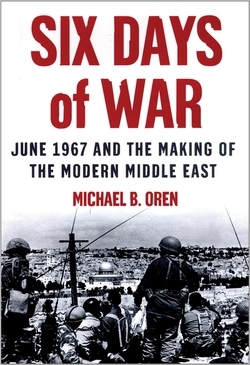 And this June is marked by the publication of Six Days of War: June 1967 and the Making of the Modern Middle East (Oxford University Press) by Michael Oren, the finest book ever on this topic. Oren, an Israeli scholar of American origins, tells his story in a spare, direct and gripping way, replete with punchy quotations. Six Days of War benefits from sources in six languages and is the first account to rely on recently opened state archives, which let the account provide the previously unknown inside story, including a number of scoops (such as the Arab plans for conquering Israel; or how Defense Minister Moshe Dayan's orders to seize the Golan Heights violated his terms of office). No wonder it is a U.S. bestseller even before its formal release. Why did the war take place? The question arises because, like World War I, no one planned for or wanted this war. Oren's research offers insights into its thoroughly accidental quality. In November 1966, for example, after the killing of three Israeli policemen at the hands of Jordan-based terrorists, the usually efficient U.S. ambassador to Israel waited a few days to transmit a message of condolence from Jordan's King Hussein to the Israeli prime minister. His delay prompted the Israelis to retaliate, and that retaliation in turn became a major episode in the escalation to war. The role of accidents needs to be kept in mind these days, as the winds of war again blow in the Middle East: Even the slightest misstep could cause a blow-up. How did the Israel Defense Forces win so overwhelmingly? By meticulous practice and absolute realism, in contrast to the Arab militaries, which lived in a fantasy world. If the Israelis were all nerves on approaching war - Chief of Staff Yitzhak Rabin suffered a breakdown - the Arab leaders were supremely overconfident. A Syrian general predicted a victory over Israel in four days "at most." Egypt's President Gamal Abdel Nasser showed no signs of concern, insisting that Israelis were incapable of mounting precisely the surprise air attack that they in fact pulled off. More broadly, one high Egyptian official said about his side's leadership that it believed "the destruction of Israel was a child's game that only required the hooking up of a few telephone lines at the commander's house and the writing of victory slogans." How did the war affect Arab-Israeli diplomacy? It fundamentally changed the terms. Already in mid-May, weeks before hostilities started, the Middle East hand at the White House, Harold Saunders, suggested that Israel should be allowed the time to trounce its enemies, seeing in this a way "of settling borders and, maybe even refugees." By the second day of warfare, President Lyndon Johnson had formulated the outline of the land-for-peace policy that 35 years later still drives U.S. diplomacy toward the Arab-Israeli conflict: Israel should return the land it conquered in 1967 in exchange for its recognition by the Arabs. Americans expected the scale of Israel's military triumph to show the Arabs the futility of their hopes to destroy the Jewish state, an analysis that found immediate agreement among some Israelis (including Yitzhak Rabin, later the prime minister who initiated the Oslo negotiations, which was premised on precisely this assumption). But, as recent events have so vividly proved, the land-for-peace premise was false. With just a few exceptions (such as Egypt's President Anwar as-Sadat), Israel's willingness to make this exchange precipitated violence against it, not acceptance, by the Arabs. Oren shows how land-for-peace was based on American hopes, not Middle Eastern realities; his research points to this failed policy needing finally to be replaced by a more realistic approach. As Oren's subtitle suggests, those six days of war had truly profound consequences.